The beach is a great social magnet for Australians. There is hardly a person in this nation who is not drawn to the ocean. In fact, over 85 per cent of our population lives within 50km of the coast and there is little sign of that changing anytime soon. 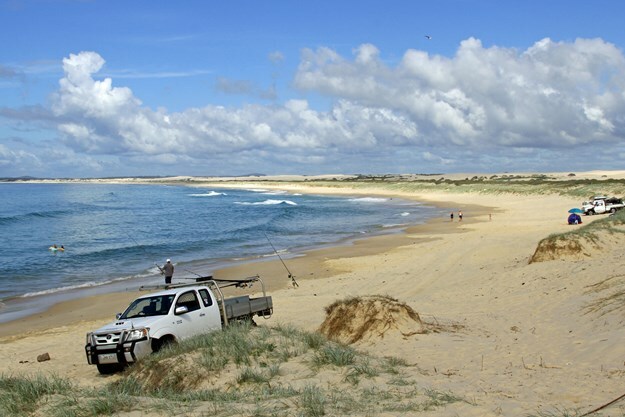 The ways in which we use our many amazing coastal spaces, scattered everywhere from Tasmania to WA, vary greatly. Some people head to the coast to watch their children be free and active in a clean, healthy environment. Others head there for physically challenging pastimes, such as surfing, parasailing, scuba diving, spear fishing and swimming. Alternatively, the beach can act as a pressure relief valve from the stresses of our hectic modern world. Stretches of uncluttered and uncrowded sand give us space to sunbathe, fish, beach dive, whale watch, gently wade, splash about, or simply stroll. For all of us campers out there, who enjoy a laid-back getaway and have an interest in the natural world, the beach is an ideal location. We are lucky in Australia with plenty of national parks and reserves dotting our coast where we can set up camp in a truly relaxing setting. One of the main attractions for those who like to take it easy on holiday is the eclectic mixture that washes up on our shores. Beaches are a repository for all manner of unique natural and man-made cast-offs, each telling their own story. The waves, winds and tides are perfect natural delivery systems for the remnants of whatever lives on or near the beach. These forces act in unison to deposit flotsam and jetsam along the 'strandline': the highest point reached by waves. Although the wet sand near the water is easiest to walk on, the strandline is always more entertaining and interesting. One of the great delights about strandlines is the diversity of natural items to be found there. For the curious among us, these items can educate or entertain. Piecing together their origins or learning about the region through them can consume a sunny afternoon. Commonly found along our coasts are the leathery brown spirals of shark egg cases, the clear C-shaped gelatinous masses that carry moon snail eggs, cuttlefish bones, abalone shells and sea sponges. Rarer finds include paper nautilus shells and sawfish rostrums: the saw-like extension of the fish’s face. To get the most out of beachcombing, you can download the Beachcomber’s Guide to Plants and Animals in South Australia’s Marine Parks free. The guide is oriented closely to the environment in South Australia, but is a good general guide to any Australian coast. There are other useful guides available online. The curious mix on our shores can be disturbing too. The strandline can hold old plastic bottles, styrofoam floats, scraps of nylon rope, paddle pop sticks, fishing gear, water-worn timber, singular thongs, bits of surfboards and the other random debris of the modern world. Even deep within our national parks, in areas that should be pristine, we sadly find this litter. In 2010 over eight million tonnes of plastic found its way into the world's oceans. Australia was responsible for about 10,000 of these tonnes. Although this falls well short of some other nations, it is far from acceptable. Much of this plastic breaks down into a soupy mix that ends up circulating in one of five circular currents in the Pacific, Atlantic and Indian Oceans, known as gyres. Some of this stays in the ocean indefinitely, but scientists believe that over time much of it finds its way back onto the world's coastlines. Casual observation while walking down many sandy stretches will have you figuring that's an accurate assessment. This year, a report issued by non-profit group Ocean Conservancy, following a global clean-up of coastal areas, stated cigarette butts were the biggest polluter with over 2.4 million items cleaned up. Food wrappers came in second at 1.7 million, plastic beverage bottles third at 1.6 million, and plastic bottle caps fourth at 1.1 million items. Overall, the group cleaned up almost 10 million kilograms of rubbish worldwide. A great thing to do to limit the impact of this waste is to clean up as you walk. Take a pair of gloves and a plastic bag and remove ten items of rubbish on each trip. It's a low-effort contribution with a big impact. The world will be a little better off for your effort. Sometimes the leavings of humanity are worth keeping rather than disposing. For example, users of metal detectors can spend many productive hours fishing out coins, jewellery or other valuables buried within the sand. Others simply keep a sharp eye out for items of interest. After all, who knows what you will find. Don’t take anything that’s alive. Do protect yourself from the sun by wearing a hat and applying sunscreen. Don't pick up anything dangerous such as cone shells, bluebottles and blue-ringed octopuses. Do keep a weather eye out for saltwater crocodiles, when up North. Do keep an eye out for the erratic waves and slippery rocks. Do go searching after storms or at low tide for better results. Do brave the cold, because you're more likely to find items of interest when few beachcombers are out and about. Check out the full article in issue #131 of Camper Trailer Australia magazine. Subscribe today for more of David's articles, as well as the latest camper trailer news, reviews and travel inspiration.